Four powerful explosions occurred between 9:00 and 9:30 pm, sending terrifying echoes to many parts of the town. 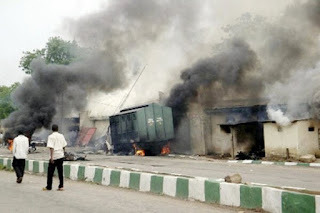 NEMA’s Northeast Zonal Coordinator, Mr Bashir Garga, who confirmed the incident to newsmen, said that the blast occurred outside the town. “Details on the incident is still sketchy. It occurred behind the trenches and only the suicide bombers were killed,” he said. The official added that normalcy had been restored to the area.